Brazil, Rio de Janeiro, 12/19 January 1985. 2nd encore : We Will Rock You / We Are The Champions / God Save The Queen. Queen were general performers of the big festival in Rio de Janeiro. The festival was running 10 days, the group played only two nights, 12th and 19th of January. Before Queen there had played groups such as Iron Maiden and The GoGo with B52 in the second night. Calculated visit rate of each show was between 250,000 and 300,000 people, and the performance, later broadcasted in Globo television in South America, was watched by above 200 milions of people. Queen took the stage in 2am, both nights. 'Rock In Rio Blues' is similar to the piano improvistaton, played on the last European tour, but it has been reworked especially for south american audience. Brian introduced 'Love Of My Life' : "You want to sing with us? Alright. Well, this is especially for you. I have to tell you that this song is very special to the people of South America, and we thank you very much for making it special throughtout the world. This is called 'Love Of My Live' ". And then Freddie started to sing, but the audience was very anxious and showed them their adopted english vocabluary and sang almost louder. Freddie left them to sing alone and after the verse he sent kiss to them and Brian pointed: "You sing very nicely". When Freddie finnished his singing to let Brian play his acoustic solo, the audience went into one big wave of "BRIAN... BRIAN... BRIAN... ". It was really hard for Brian to play anything. Later he added some pieces from 'Let Me Out' (song from his 'Star Fleet' solo project). 'I Want To Break Free' - Freddie entered with fake breasts and with wig. 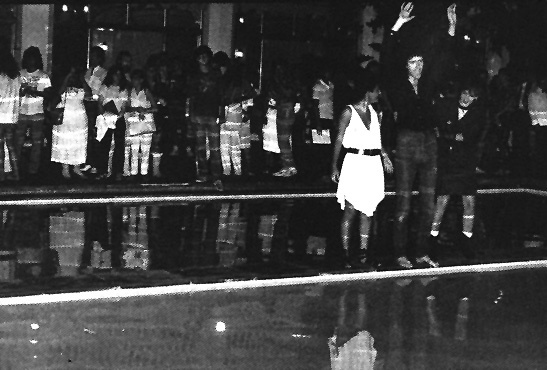 The reaction of the audience was similar to the reaction from the South America tour. He was not ready for this reaction, but he was smiling and took that strange things off. Later he said: "I could have been stoned to death as Sheba Queen, but I don't wear these things anymore." During the 'We Will Rock You' song Freddie came with big Union Jack flag above his head. He moved to the stage border and turned 180 degrees. Then the UK flag was visible as he was moving back. Quarter of a million people appreciated it with big cheers. Few moments later Freddie threw the flag into the audience. After the last chords of 'God Save The Queen', the big fireworks lighted the sky above the stadium. While the fireworks the group moved to the cars and traditionally quickly left the stadium. Quite apart from Globo Television's coverage of the festival, the second Queen show was filmed for later release on home video. It was released in May 1985. Every performer was invited to the EMI's big party, held in Copacabana Palace Hotel in Rio. Second party, near the hotel, was arranged by the local fans. 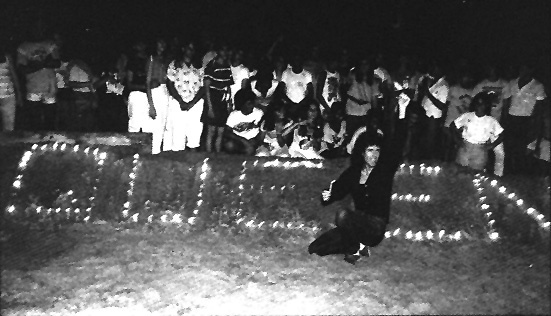 They putted 500 of candles into the sand to make Queen title. Brian got to know it and went there with his daughter to join the fans.